A year ago, Longines release the Avigation Watch Type A-7 pilot’s watch. Inspired by a 1930s U.S. military pilot’s watch, it was a cool modern take on a cool old watch. Longines has just released another Avigation watch, the Avigation Oversize Crown, inspired by a watch they produced in the 1920s. 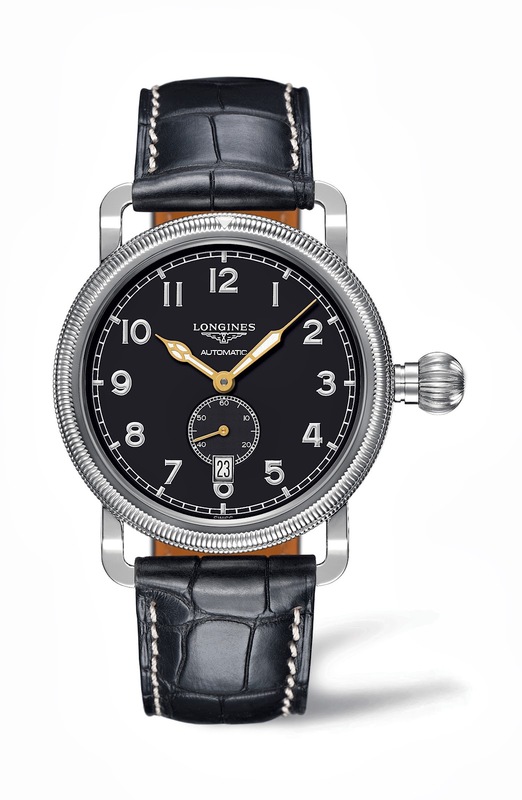 I guess that since the Longines Avigation Oversize Crown, in all three variations, takes a cue from a watch from the 1920s it makes sense that it looks like a 12-size pocket watch with lugs and a band. I’ve shown photos of this watch to a few people to universally mixed reviews. Some love it and some absolutely don’t. I happen to actually like it. But, then again, I’m kind of a pocket watch guy. As I said, the Longines Avigation Oversize Crown comes in three variants, the Three-Hand with both a date window and sub-second register at the six o’clock position, the 24-Hour with a date window and the three o’clock and a fourth hand indicating a 24-hour second time-zone, and the single-pusher Chronograph which is a two-register with the date at the six. All three versions are housed in a 41 mm stainless steel case with a single-index, bidirectional bezel (which is designed for a pilot to use in setting directional way-points) and a black dial with white numerals and gold-plated luminous hands. It is really a cool and clean looking dial that comes from the 1920s. 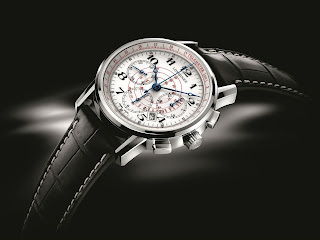 The Chronograph uses Longines’ exclusive L788 column-wheel chronograph movement, but I not sure which movements the other use. I do know that all three are self-winding mechanical movements. Prices for the Longines Avigation Oversize Crown are as follows: Three-Hand, $2,400; 24-Hour, $3,100 and Chronograph, $3,500. Not too bad. For a bit more info, check out the press release below. The Longines Avigation Oversize Crown: Elegance Combined with FunctionalityOn the strength of a rich history, notably illustrated by the magnificent achievements of the early aviators, the famous Swiss watch manufacturer is proud to present The Longines Avigation Oversize Crown, a perfect example of an aviation watch: aesthetic quality tempered by the pilot’s needs.Based on a Longines model produced in the 1920s, The Longines Avigation Oversize Crown includes more than one feature that will fascinate fans of aviation watches as well as those keen on timepieces that boast the beauty of a pedigree.The ideal accessory for a pilot, with its 41 mm diameter, its black dial featuring white numerals and gold-plated, luminous, pear-shaped hands it is extremely easy to read in the semi-darkness of the cockpit. Each piece in this new line is numbered.The bezel is also marked with a single index and can be turned in both directions, enabling the pilot to set his reference points. Thanks to the fluted decoration around the bezel, it can be manipulated with great precision. And as for the oversize crown and winding stem, which stand away from the case, they enable a pilot wearing gloves good access to the bezel without coming into contact with the crown. In the original model, this bezel enabled the pilots to record time data when chronographs were still rare, as well as to record the times of important events when they were on a mission or, then and now, times of meetings.While The Longines Avigation Oversize Crown has retained the basic design of the original model, it is fitted with a mechanical, self-winding movement and available in three stainless steel versions which are all guaranteed to enthrall the most demanding customers. 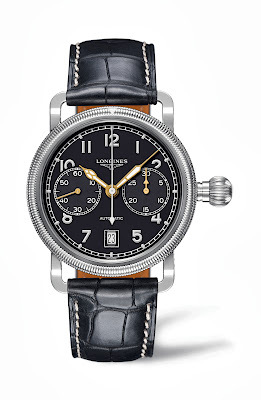 The basic version shows the hours, minutes and seconds, while an alternative model has a second time-zone and the third is a single push-piece chronograph fitted with Longines’ exclusive column-wheel chronograph movement (L788). Longines has been based at Saint-Imier in Switzerland since 1832. Its watchmaking expertise reflects a strong devotion to tradition, elegance and performance. Longines has generations of experience as official timekeeper of world championships and as partner of international sports federation. Known for the elegance of its timepieces, Longines is a member of the Swatch Group Ltd, the World’s leading manufacturer of chorological products. 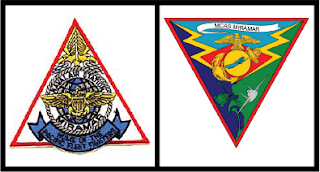 With the winged hourglass as its emblem, the brand has outlets in over 130 countries.